Biography & Genealogy: Coke Flannagan, Class of 1913: Genealogy: Born- Sept. 27, 1892 in Richmond, Va. Father- Dallas Flannagan; Mother- Elise Coke. Pat. Grandfather- William W. Flannagan; Pat. Grandmother- Frances Jordan. Mat. Grandfather- John Archer Coke of Williamsburg, Va. Mat. Grandmother- Emma Overby of Mecklenburg Co. Va. Married- On Dec. 23, 1921 to Alma Irene Bassett, daughter of Henry Devers Bassett of Tampa, Fla. Children- 1- John Coke Flannagan. VMI Record: Entered VMI- Sept. 6, 1909; Dropped from rolls Feb. 20, 1911 for Class Mutiny; Later Reinstated; Graduated ca. June, 1913 ranking 31st in a class of 34. 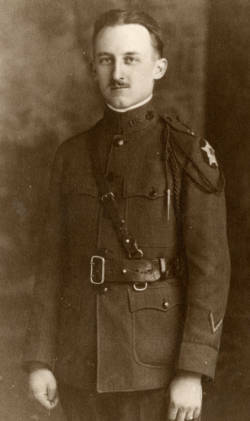 Military Record: Captain of 23rd Infantry, Signal Corps, 2nd Division American Expeditionary Forces during World War I; Awarded Croix de Guerre with Silver Star by French Government for brilliant services; Highly commended by his superior officers for Radio Work in the A.E.F. ; Recommended to be promoted and retained in the Service after the conclusion of hostilities. Careers: Radio Engineer; worked for Bell Telephone Company Laboratories. Died- Date of death unknown.